BR #1 (Serenity Suite): Main floor. Poolside room, king bed, pool/ocean view, private bath (shower plus bathtub), a.c., satellite TV, mini-frig, safe, bathroom magnifying mirror and hair dryer. BR #2 (Dream Suite): Second floor, king bed and double bed, ocean view, balcony, private bathroom (shower plus bathtub), a.c.. satellite TV, mini-frig, safe, bathroom magnifying mirror and hair dryer..
BR #3 (Gratitude Suite): Second floor, king bed and single bed, ocean view, balcony, private bathroom, a.c., satellite TV, mini-frig, safe, bathroom magnifying mirror and hair dryer. 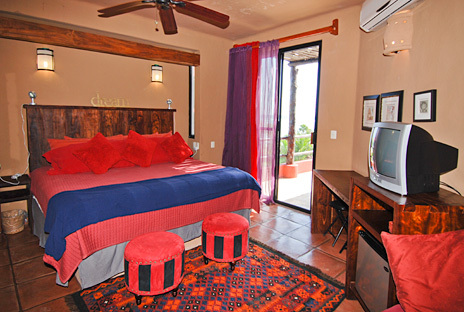 BR #4 (Joy Suite): Second level, king bed and single bed, ocean views, balcony, private bath, safe, a.c., satellite TV, mini-frig, safe, bathroom magnifying mirror and hair dryer. BR #5 (Tranquility Suite): Second level, king bed, ocean views, balcony, private bath, safe, a.c., satellite TV, mini-frig, safe, shower on balcony, bathroom magnifying mirror and hair dryer. Rate does not include 14% tax. $1000 refundable security deposit required in US cash or US travelers checks collected onsite and returned at departure barring any undue damages. 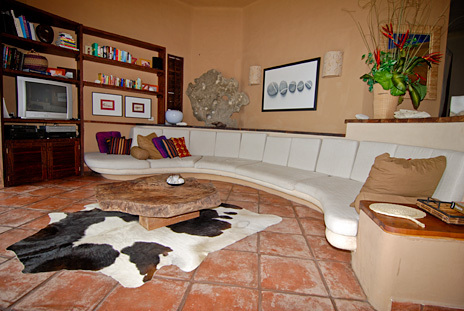 Zen del Mar vacation rental villa is a stunning Mexican modern masterpiece in design and furnishings. This luxury Villa is situated on a secluded private beach in Jade Bay yet within walking distance from Jade beach into the town of Akumal. 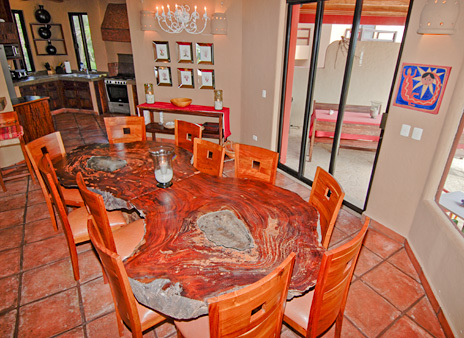 This amazing villa offers the luxury furnishings and services for a special holiday on the Mexican Caribbean. 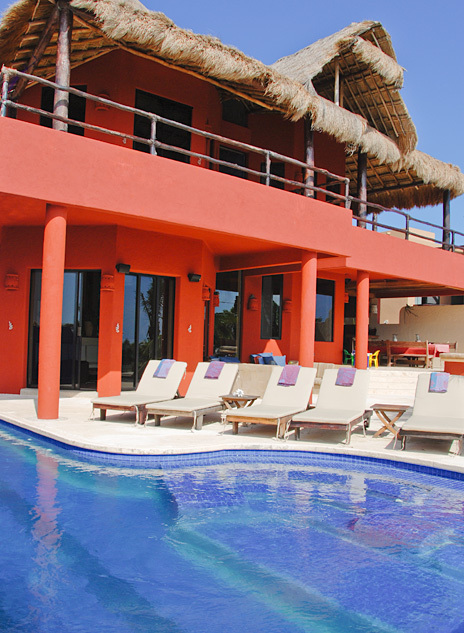 The owners of Zen del Mar have designed this Villa after years of providing luxury rentals at the adjacent villa; Casa del Sol Naciente. 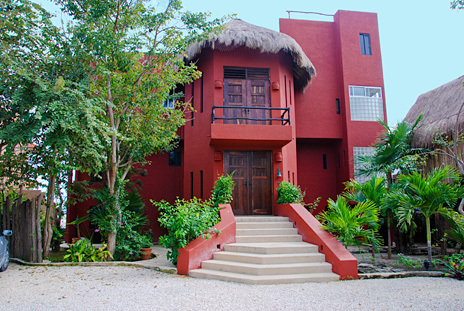 From the moment you see the color of Zen del Mars claret red painted exterior, historically used by the Mayans to promote good energy, you will begin to relax. Your pace will begin to slow down. The hand-made terra cotta tiled floors and the heavy wooden double doors greet you with a feeling of being on vacation in Mexico. There is an immediate sense of holiday, a calm breeze, a sense of security, and a melding union of the blue wall that mimics both the ocean and the sky outdoors. The unique Palapa-roofed entryway soars 30 feet high above you to meet the sky. Your senses will heighten as you see through the 25 foot glass wall that frames your sky high view of the Caribbean ocean. The first floor hallway interior reveals the natural stone Mayan archway inviting you into the Villa. The floor plan of Zen del Mar is a designed synergy of indoor and outdoor spaces that maximize the ability to be outdoors and indoors all at the same time. The rhythm of living in Zen, the garden, the beach, the pool, and the private living zones create a Villa that is unique and maximizes the wide expanses of ocean views. The Villa can accommodate up to 14 people and never feel crowded. Special attention has also been given to insure privacy with separate individual areas devoted to quiet space for solitude and/or beach massages. 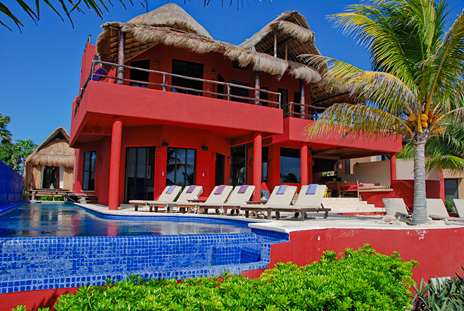 Villa Zen del Mar, meaning calm from the sea,  is a spacious 4,800 square foot home that can accommodate up to 14 people. All five king-sized bedroom suites have private bathrooms en suite, a television and a mini-bar refrigerator. Four of the king-sized bedroom suites are located upstairs and one king sized bedroom, the Serenity Suite, is located on the main floor. 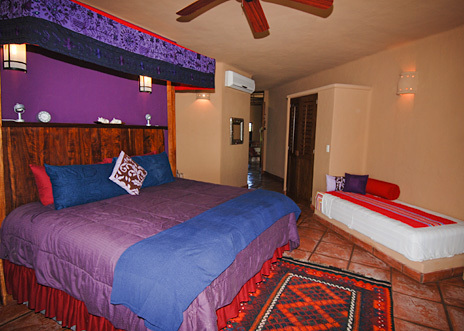 The bedrooms upstairs are named Dream Suite, Gratitude Suite, Joy Suite and Tranquility Suite. In addition to the five king-sized beds, two bedrooms; Joy and Gratitude suites have built in single beds for additional sleeping or lounging. 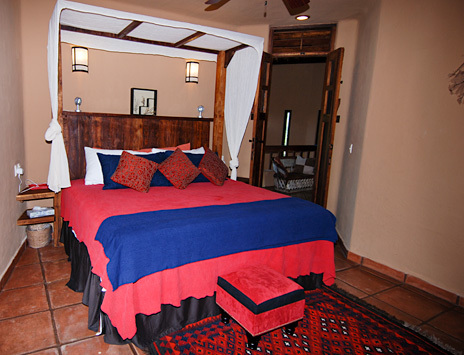 Dream Suite, a king sized bedroom, has a built in double bed. 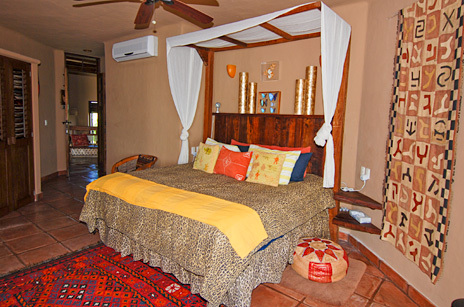 There are a total of 8 beds in the villa, all with pillow-top mattresses, which can comfortably sleep up to 14 people. All bedroom suites capture views of the ocean. The villa is entered through massive hand carved hardwood doors which lead you through a Mayan Stone archway. This is your introduction to the majestic ocean view straight ahead. The villa has a grand circular-seated living room with two sets of glass doors that can disappear to reveal the adjacent 60 foot long Infinity edge swimming pool and the Caribbean sea. Living room has hardwood book shelves that host the satellite TV, five disk CD player, DVD, VCR and a multi-speaker sound system which can accommodate an I- Pod by cable. 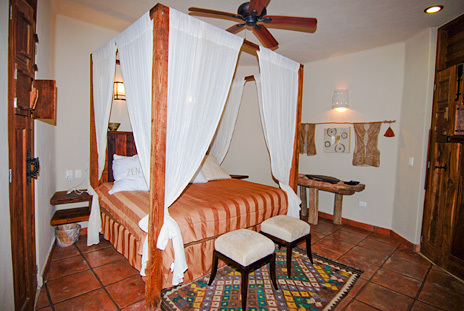 The villa was designed by the owners with a love for Mexico and the Yucatan region. The house was influenced by the work of the famed Mexico City Architect, Ricardo Legorreta. 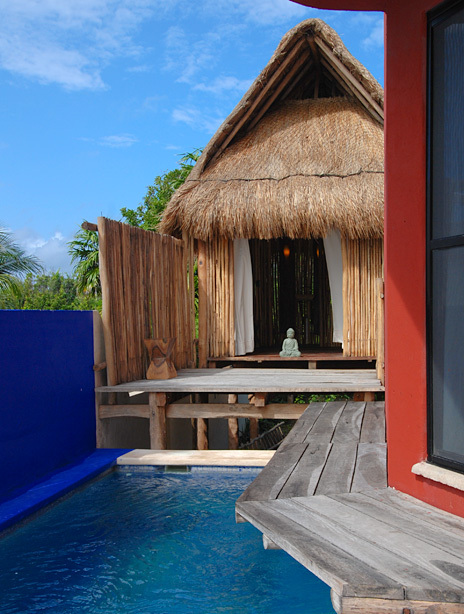 Zen del Mar was built by a local team of Mayan artisan builders. The design marries elements of modern Mexican architecture with local Mayan craftsmanship Zen del Mar makes generous use of the indigenous materials and crafts of the Yucatan and the Mayan people. The designers, who have traveled extensively, have used pieces from global destinations and the world of fashion to create a different type of beach house. Outdoor Barbecue Kitchen: Zen del Mar has a fully covered outdoor kitchen / grill area located next to the indoor kitchen food preparation area, where meals can be prepared and grilled. An ideal location, two steps away from the indoor kitchen, makes it easy to Grill Fresh Fish or a meat of your choice on the 4 foot built-in charcoal barbecue. It was designed to be easy to serve the meal on the built-in bar next to the grill with guests directly overlooking the outdoor dining room with an ocean view. ZEN Pool Power: The pool is a true swimmers delight as it is a unique 60 feet in length. There is a marked swimmers lane for people who really want to exercise or swim laps. The Zen pool has an infinity edge, with a waterfall edge that cascades onto your shoulders when sitting on the pool bench viewing the sea. Two dark blue tiled lounge chairs are built into the pool steps allowing adults to sit with small children in the water. This pool was designed for swimming, family play, and lounging in the water. At the edge of the pool, find ten hardwood lounge chairs. Nearby is a separate circular Adult Sand -pit lounging area. This special Sand circle has Lounge chairs and an umbrella to offer shade, if needed. 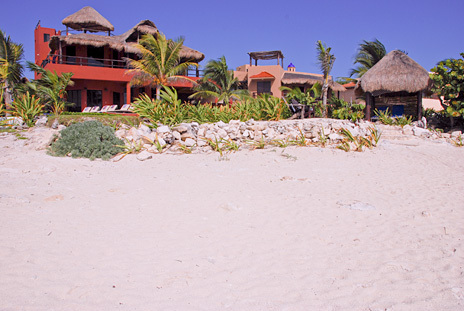 Spa Services have a home in the Zen Spa Beach Palapa. The secluded Palapa on the sand, next to the Sea, is both quiet and partially hidden with Sea Grapes and is the perfect place for the five complimentary massages provided by a professional Masseur. 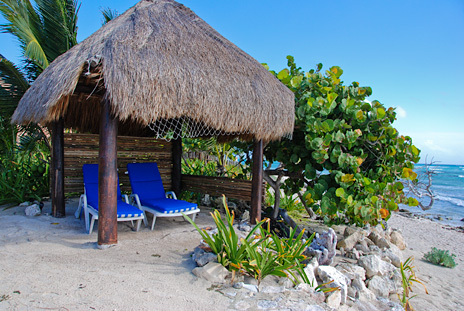 This beach palapa is also the perfect hideaway spot to read a book or to take a nap for non-Sun lovers. A Stairway to the Stars takes you up to the rooftop for the widest ocean vistas on Jade Bay. Rooftop Here you will find a Palapa covered Bar area with two large seated couches. Zen del Mar has a convenient refrigerator at the rooftop so you are never far from libations. A Star gazing double bed made of cement, on the opposite side of the roof, was designed to lay on with an air mattress to watch the stars in all their glory as they appear in the Mexican sky. This area can be made up with sheets to sleep under the stars if you so desire.